When he’s not speaking, writing or seeking out new adventures, Simon runs a program called the Digital Champions Club—an approach to driving incremental, bottom up improvements in organisations through technology. The Digital Champions Club is founded on the belief that in most organisations the number of technology opportunities far exceeds the capacity of the IT department. This means valuable improvements are delayed or not implemented at all, which in turn leads to lower productivity, frustrated employees, and poor customer service. Many of these opportunities don’t require specialist IT knowledge and skills. They can be taken up by technology-savvy end users with off-the-shelf solutions. These digital champions are the people in your organisation who understand the business first and the technology second (whereas IT departments mostly operate the other way around). Digital champions are internal resources who, with just a little bit of training, can consistently and effectively implement small technology-driven improvements. The Digital Champions Club is an approach to providing digital champions with the rigour, accountability, and support they need. Everything in the program is designed to shortcut the time required to assess and deliver digital projects that add value to the organisation and its people. To find out more click on the button to visit the Digital Champion’s Club website or fill out the form to download the Champions of Disruption whitepaper. Do your technology projects sometimes fail to deliver? 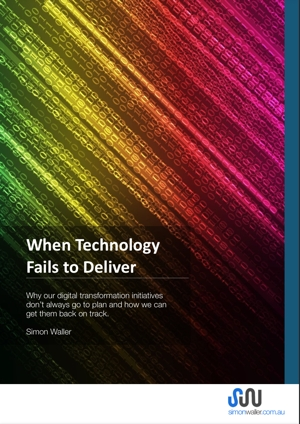 Find out why our digital transformation projects don’t always go to plan and what organisations can do to get them back on track. Just provide your details below and we will email you immediately with a download link for Simon’s latest white paper When Technology Fails to Deliver.